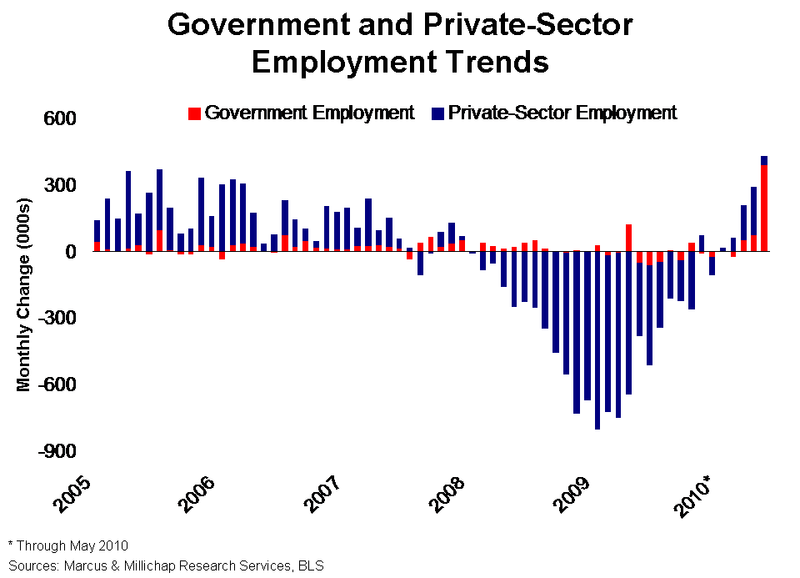 Monthly employment gains in May were the highest in 10 years, but substantial government hiring was overshadowed by the limited contributions of the private sector. This disproportional reliance on the public sector highlights challenges facing the pivotal transition of economic growth from government-led activity to the business sector. Jobs were created for a fifth consecutive month in May, though a turbulent equity market and lingering concerns over European credit markets deterred employers and sapped the momentum provided by widespread job gains in April. In the months ahead, the willingness of private-sector employers to significantly expand payrolls will become more vital to sustaining a recovery, particularly as recently created census positions are terminated and those workers seek new employment. While the government created 411,000 temporary census jobs for a net addition of 390,000 government positions last month, the private sector generated only 41,000 jobs for a total of 431,000 new positions in May. Private-sector growth was led by manufacturing, which hired 29,000 workers, down from 40,000 positions in April. Manufacturers have expanded payrolls each month this year, and the average manufacturing workweek rose to its highest level since the early stages of the recession, indicating the likelihood of additional hiring. Census positions account for more than half of the 982,000 jobs created thus far in 2010. Combining temporary and full-time positions, government employment has increased by 487,000 workers this year. The planned termination of temporary census jobs in the months ahead, however, will offset many of the expected gains in other sectors. In coming months, the government’s role as a job generator will diminish as budget shortfalls force numerous state and local governments to reduce their headcounts. Without an accelerated pace of hiring by private-sector employers, the formation of new households will likely lag, delaying a robust recovery in the multifamily sector. In the first quarter, nationwide apartment vacancy was flat at 8 percent, following nine consecutive quarters of increases. This year, vacancy will fall 30 basis points to 7.7 percent due to a sharp reduction in completions and a modest rise in demand. A more significant decline in vacancy will not occur until job growth expands the pool of prospective tenants. While the professional and business services sector has grown by 175,000 workers so far this year due to the hiring of temporary workers, full-time office-using employment has decreased by 78,000 jobs year to date. A resumption of growth in this segment later in 2010 will help backfill under-utilized space, but slack demand for additional space will result in a 100 basis point jump in vacancy this year to 18 percent. Downsizing by office tenants will also contribute to projected negative net absorption of 24.8 million square feet in 2010. This entry was written by marcusmillichap, posted on June 9, 2010 at 12:13 am, filed under Research and tagged Employment. Bookmark the permalink. Follow any comments here with the RSS feed for this post. Trackbacks are closed, but you can post a comment.